February courses begin officially on January 14, the focus weekend takes place February 9-10, and final assignments are due March 8. Christian Social Witness. Harold T. Lewis, 2001. Students will also be invited to read another text on issues related to poverty in the United States and lead a discussion in class about the particular text. A list of potential books for this project will be included with the syllabus. The Very Rev. Charles A. (Chas) Marks is Rector of St. Augustine's Church in Kansas City, MO and also serves as a Senior Advisor for Community & Church Relations for the Saint Francis Foundation. Fr. Chas is the Dean of the Northwest-Metro Deanery of the Diocese of West Missouri. He is a graduate of Wichita State University, Saint Meinrad School of Theology, and The Bishop Kemper School for Ministry. Prior to his ordination to the priesthood in 2015, Fr. Chas worked in social services in Kansas City, MO and Memphis, TN. He spent 10 years managing programs that assist homeless and runaway youth in the Kansas City metropolitan area and also served on the Advisory Board of the National Safe Place Network. Fr. Chas has presented at several national conferences on issues around homeless youth and advocacy. 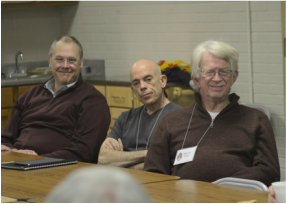 He is a certified facilitator of Called to Transformation: An Assest-Based Approach to Engaging Church & Community. For this class, students will be expected to provide two or more previously delivered homilies for the focus weekend. They will also write and present homilies composed during the seminar. Students will need to bring writing materials or electronic word processing for use in the seminar.